A new, exciting jewellery collection from Kenya! Handmade individual designed pieces from our Mara, our Kenyan designer - typical rustic African designs with beads made from natural agates, batik bone and finished to the highest quality, All items are personally designed and made by Mara and come with a box or gift bag. 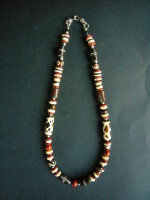 This necklace is 17" in length (43cm) and generally sits on the neckline. 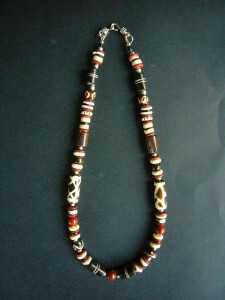 Handmade batik beads in shades of brown and cream inset with natural russet carnelian and finished with a high quality Tibetan style clasp.